I've had a couple interesting and very encouraging readings since my last post. One was the extended 6 month transit reading that I received a day or two after the last post. The second was my own reading, this time a full Celtic Cross spread using the Angel Tarot deck. I had used it to do a reading for a friend, which I recorded and published into an unlisted movie to my Strong Spirit Woman YouTube channel. This seemed to work well, so I may use this format when doing readings for others. The movie can get published as a private movie that I just share a link to your email ~ so ~ if you are interested...leave a comment down below. I can also forward my email to you. Moving onto the transit reading that I ordered. Let me start off by giving you the dates that are important for you from an astrological perspective. Your configuration has clearly shown me that these are the dates which are going to be beneficial for you. My analysis has confirmed that you will win a sufficient sum of money and then use this money for investment purposes to gain long-term financial security for your future. The investments that are best suited to you are building/investing into a small online business. I would not recommend any investments into stocks and shares at this time as it is not showing as favorable for you. Could a reading start off any better? I've been praying for a windfall. Aren't we all! But I have also been praying for signs ~ and even pondered getting a reading from an outside source prior to randomly coming across the link that led me to the free reading, that became the 6 month transit reading. Would a potential windfall ACTUALLY be revealed in a reading??? It was a fleeting hopeful thought that I never imagined would happen. It was more like being audacious enough to ask, yet dismissing it immediately upon asking. Of course the thought did cross my mind that this was a reading from a site that farms out many types of readings. Who knows if these very words are used frequently, like a hook to draw you in. Yet, even while that thought popped in my head, another countered, "Yeah, but if it were not a potential outcome, they could lose credibility making such claims." The most interesting part about that reading was that it mentioned investing into an online business. This is EXACTLY what I have desired to do for years now. Only prior to this, my online business focus was on selling my services, online, to do at a distance. However, much more recently, my attention turned to tee-shirts. I have ideas. I just need designs. I can pay for designs, then load them up on tee-shirts, mugs, or whatever. AND, it expanded from there. I will explain HOW this impacted the trajectory of our decision. First, let's look at the Celtic Cross reading I did for myself, one week after receiving the above reading. The cars are scrunched together to be able to get the entire Celtic Cross spread into the photo. 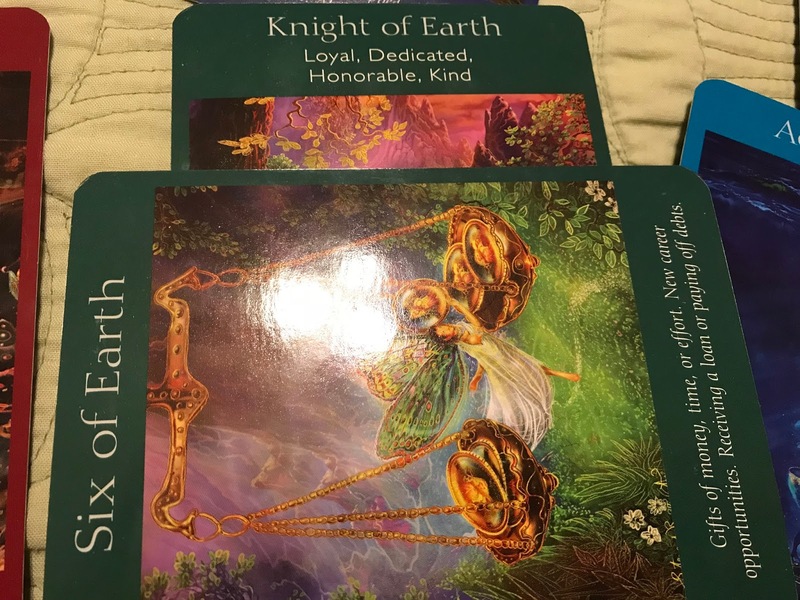 Card #1 - The issue/situation: Knight of Earth - Main message is about taking action. Honoring commitments and getting things done. This is saying clearly that the time for planning has passed. Alternative meanings include: "Renewed motivation. Increased abundance. Business travel. A guardian angel." Card #2 - Six of Earth: The message right on the face of the card reads, "Gifts of money, time, or effort. New career opportunities. Receiving a loan or paying off debts." "You may be the recipient of this bounty, or you may be the giver. Gifts may be monetary or take some other form, such as an opportunity, advice, and so forth....Promotions, bonuses, and financial rewards are all possible at this time." Additional meanings: Paying off debts, and celebrating a job well done. These two cards alone were brimming with positive validation. In fact, I really feel like some time ago, I entered some sort of state of grace. I feel my power returning, and my intuitions becoming more clear. I am acting more, trusting my own hunches with far less concern or attachment to the outcomes. In fact, it feels like the more I trust and act, the more elevated, or full of certainty that everything WILL work out positively I feel. But there is even more to this. 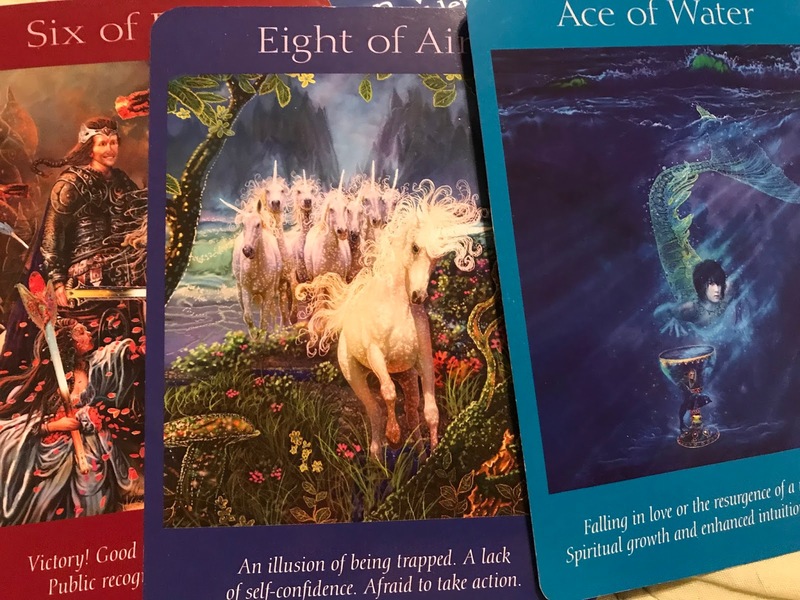 I'll get back to those alternative meanings at the end with proof that these card readings can deliver some accurate insights! Two of Air - This could be easily summed up as 'decision paralysis.' Just for fun, I'll include some of the text: "You're struggling with a decision. You have conflicting emotions or thoughts about which way to move, so you are avoiding making a choice." How unintentionally spot on! Move being the operative word here, in more ways than one! The next three cards represent the past, present, and near future. Card #4 Past: Six of Fire - "Victory! Good news is on its way. Public recognition or rewards. "This is a time of great achievement and success. People think highly of you, and your reputation is excellent. You've made good decisions and worked hard. There may be some sort of public acknowledgement of your contributions, or you may be given an award for your achievements. Good news is on the way....Good fortune." This validated that I have been focusing in the right ways. I have made a turn around, especially from the plant-based daze. I have regrouped, felt more aligned, empowered, and like myself again. The rapid premature aging of that diet has halted. More healing to be had, but mentally, emotionally, I've never felt more focused, clear, aligned, empowered, and free. So I don't consider the 'Victory' to just be of the past, but rather it is exactly describing the upcoming rewards as a result for having 'paid my dues.' And I really feel that through the course of my life, I have paid some MAJOR dues! Card #5 Present: Eight of Air - "An illusion of being trapped. A lack of self-confidence. Afraid to take action." Interestingly, in the Osho Zen Celtic Cross spread, this would be in the past position. 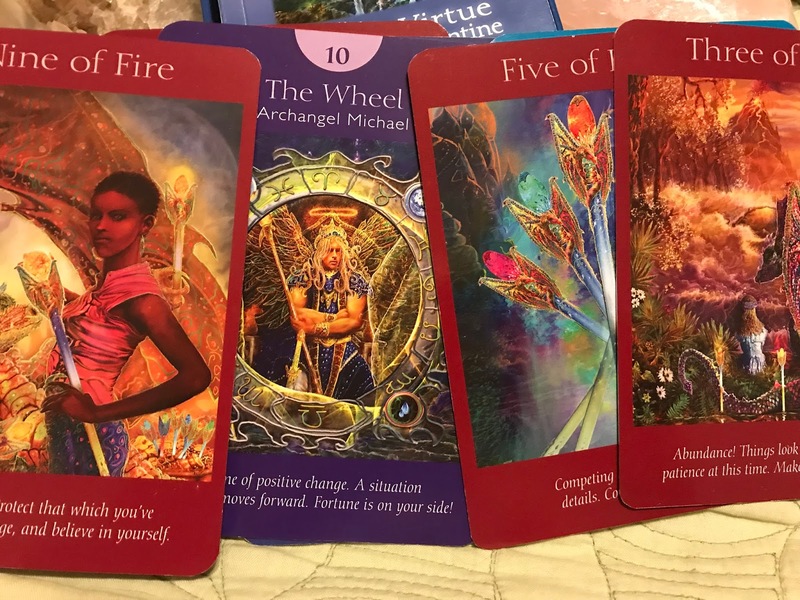 According to how that Celtic Cross is laid out, card number three is the unconscious influences, number four is the conscious influences, number five is the past as it pertains to the issue, and six is the future. But, I'll go with the Angel Tarot deck layout since that is the deck I'm using. Here are my main take aways: First, in many ways I have been feeling 'trapped.' When straddled with debt, there is a lot less (apparent) freedom of choice. I have also been totally unclear about my own professional identity or desires. On one hand, there is what I trained to do. Translated, there is what I paid a lot of money to learn to do. On the other hand, there is what comes naturally to me. I have a part that was experiencing a mental block to making what comes naturally more part of my entire expression, in a manner that suited my temperament. I had what I would consider a sort of soul loss decades earlier. I had signed up to be a nutrition major as an undergrad, but was talked out of this course of study. As a result, I ended up feeling pretty lost in school, and for years afterwards. There is much more to this, which i will elaborate on in the next post. I can be 'business oriented' yet I am not wired like most. I rebel against the 'rules' of success type mentality. I am not good at creating fluff marketing pieces, exaggerating about what I do (contrarily, I had a habit of down playing my abilities), making empty promises, or writing an endless stream of emails with appropriately linked hooks, trapping people in all the ways that I despise being trapped myself. You know, an article about "top tips for..." and, click on this for a great bargain offer only available if you act now" or "free trial" (until you are unwittingly billed on auto shipments) and endless upsells that take up way more time than anticipated. "Believe in yourself and keep your thoughts positive right now." Something has definitely shifted, and I am having a clarity about what to do. And, it is still also freaking me out a little inside. Like I'm biting off more than I can chew. Here is where I enter the hook...you'll have to keep reading to understand why. To keep this post from getting too long, I'll continue with all the coincidences and my new project in the next post. Card #6 Near Future: Ace of Water - "Falling in love or the resurgence of a relationship. Spiritual growth and enhanced intuition. A new home." Did you catch that last part? A new home! The last time I did pay for a reading, which was sometime last year, Emily, the reader, also saw us in our new home situation, and mentioned that our relationship would even greatly improve. Not that it is a problem, but that we would both be living so much more purposely, that our whole vibration will be uplifted. Looking forward to an elevated life experience! Card #7 My power in the situation: Nine of Fire - "Don't give up. Protect that which you've created. Have courage, and believe in yourself!" When messages repeat, it is good to take note. 'Believe in yourself' is good advice for all! And it's definitely been quite a process in my own journey. I was plagued with self doubts for so long. In a nutshell, I've resisted something about the process of building up a practice, then simultaneously created a belief around 'not being successful' which led to more self doubt, and more paralysis. Perhaps my post is too long, but I am writing this for a reason. For those with the attention span to read it, I hope that by my sharing these deeper truths, it will resonate with others. We all have this crap going on beneath the surface. I know this as this is what I am helping others learn how to transcend, just as I'm helping my own self to do so! Let me put it all this way. When I was growing up, there was a more clear method that seemed to work for those of my parents generation. Work hard, save up, and retire comfortably. Many have rebelled against this notion. We learned to "live for today." My lower ego can look at my life and think, "holy crap, I'm in my mid-fifties, and relatively unemployable in the "real world" and yet lack motivation to get my practice built up more successfully. What gives? Where is the fire in my belly? I'm looking at 'retirement' age around the corner, and I'm still in the red! This doesn't feel very good to me! Even as I write this, however, I now have another aspect/part/higher intelligence that has learned to accept what appears true, and also hold the belief that this is all illusion. Everything can turn on a dime. And the Universe / Great Creator / God / Nature provides. Yes, I believe in hard work. It's good for us. I may have rejected this at one point, but hard work shapes us. Yet, when we align our puny will (the will/desires of the personality/ego/intellect) with Divine Will, and surrender and Trust in the unfolding plan, focusing our 'hard work' on clearing the internal clutter instead, miracles happen. Card # 8 The Effects of Others: The Wheel, #10 of the major arcana. "The angels sent this because of positive changes occurring in your life. Expect and enjoy beneficial new opportunities as they present themselves. This is an optimal time to make big and small changes. Take the leap with the knowing that everything will work well for you. Old blocks are lifting and everything now moves forward quickly." Emily told me during my reading with her last year that something I was expecting would not come before Thanksgiving (2017), but by spring (2018) things would begin to move pretty quickly. Card #9 My hopes and/or fears: Five of Fire. This card speaks of a potential clash with others who may hold different goals and values, and 'bothersome details.' This could be relating to challenges that could arise with family, especially my mom. The goal/desire is to be able to help her sell her condo in Chicago, and relocate to where we go. But, her needs/goals are quite different. She doesn't dream of living on a piece of land. That would be like a death sentence to her. She would love to be in an area with a cute town (as I would also enjoy), that she can walk and get around on her own. She doesn't drive. I'm not sure how this will play out, but I'm just taking things day by day. When we are solid on where we are going, then we'll take it from there. If needed, she can visit first, and may find she ultimately ends up liking it more than she thinks. Card #10 The Outcome card: Three of Fire. A lot of earth and fire in this spread! Action and manifestation. The front of the card reads, "Abundance! Things look very good; have patience at this time. Make long-term plans." "Congratulations, this is your golden time of celebration and success! However, it's not the moment to rest yet. You need to keep going with the next project. So step back and reviewals that you've done and then create a blueprint for the future. You need to look at things with an eye to the long term....Patience may be required while you await results from your previous decisions. Use this time to explore the possibilities for how to promote your business or talents." There is SOOOO MUCH MORE to say about all this, including a note of gratitude to an unexpected benefactor. I'll continue weaving this story together in the next post! Want to get a reading? 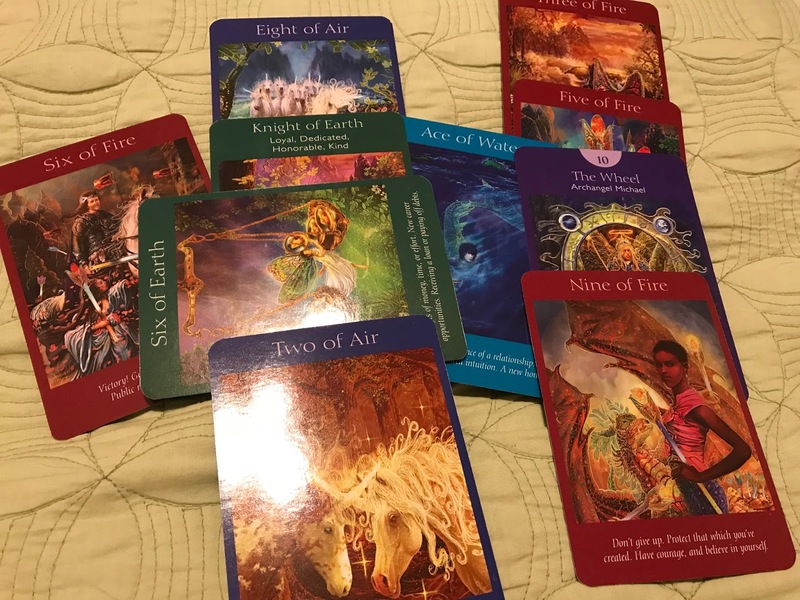 I have information on my website about readings at http://www.strongspiritwoman.com. I was thinking of making a special offer to do readings by donation for followers of my blogs and friends on a limited basis. My actual rates are on the website. I'll be putting together a PayPal donation button soon. If interested, leave a comment. If I can post my email more privately somewhere that I am not aware of, let me know! Any intuitive insights? Thoughts? Feel free to share! 💙🔥💙Just keep going, no hesitating, keep trusting and believing in yourself, stay out of your scary head, and know you have the full support of The Universe to realize all your Heart's Desires and achieve your Soul's True Purpose with Don by your side. Thanks Laura! You were on my mind the entire time while writing the article! I of course want nothing short of the same for you and yours.